Dennis Ruppel is a member of the Board of Directors of The Sembler Company, a full-service real estate firm that has developed more than 325 projects totaling more than 27 million square feet, and currently leases and manages a portfolio of nearly 10 million square feet throughout the southeastern U.S. and Puerto Rico. 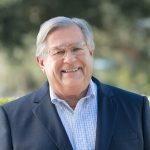 Since 1978, Ruppel has been a Partner with Johnson, Pope, Bokor, Ruppel & Burns, LLP, concentrating his practice on major real estate, financing and commercial transactions. He has worked with projects ranging from shopping centers and condominiums, to residential and mixed-use subdivisions, to industrial development. In addition to an extensive legal portfolio, Ruppel has broad business expertise as a past director of two bank holding companies; president and director of a manufacturing company and a software company; and a managing member of several real estate and investment entities. Ruppel currently serves as the Chairman of Freedom Bank of America as well as Chairman of AmCap Insurance, a commercial property insurer. A well-known community activist and philanthropist, Ruppel is a former President and current Board member of R’Club Childcare, a not-for-profit provider of quality childcare designed to strengthen children, families and communities. Ruppel has also served as a trustee for two universities, and was voted Citizen of the Year by the Clearwater Civitan Club. He is a member of the Clearwater Bar Association and American Bar Association, and a graduate of Leadership St. Petersburg. Ruppel received a juris doctorate from the University of Michigan with highest honors, and a Bachelor of Arts degree from Fordham University with honors. He enjoys sailing, swimming and spending time with his grandkids.